The Logic Controls MR2000 has been discontinued. No direct replacement is available. 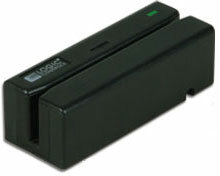 The MR2000 Series MSR is only 90 mm long and can fit almost anywhere, making it ideal for POS and desktop applications. Whether it is used standalone or attached to a monitor, touchscreen or all-in-one unit, the MR2000 provides the functionality needed with an extremely small form factor. The MR2000 Series MSR is easily programmable through the programming utility's intuitive graphical user interface. By simply clicking on buttons and entering parameters, a system integrator can easily set up the MR2000 for use with a minimal investment in time and training. It is easy to enable/disable tracks, change start and stop sentinels, and add prefixes, field terminators and suffixes. A built-in decoder reads all combinations of tracks 1, 2 and 3. The MR2000 Series MSR also supports a wide range of reading speeds and includes special firmware to avoid transmission errors due to bus contention.